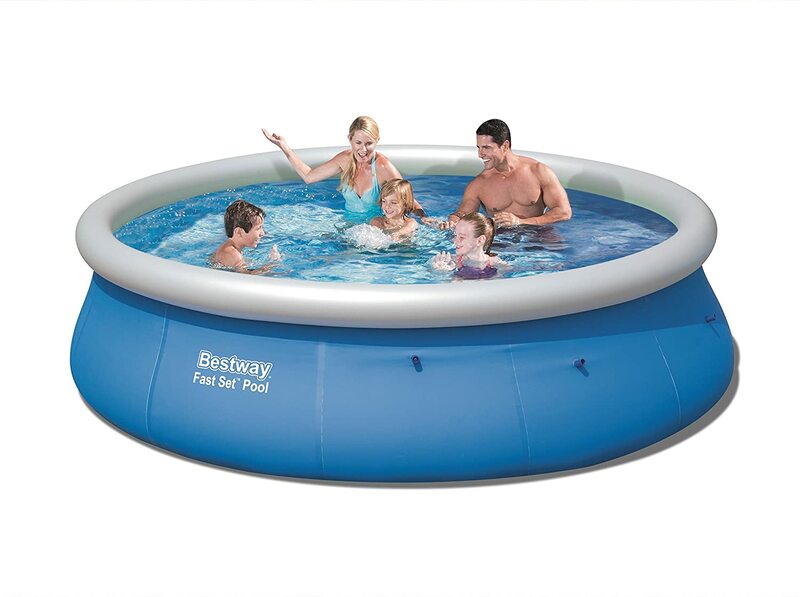 This best above ground pool reviews goes over 10 different above ground pool and inflatable pool reviews whether they are lounging/relaxing pools or pools large enough for swimming. As inexpensive alternatives, above ground pools are an increasingly popular choice for anyone looking to beat the heat. While they aren't as long lasting as inground pools, they will definitely do their job of keeping you cool and letting your kids play. Unfortunately, keeping them clean isn't always easy, but check out these above ground pool vacuum reviews to help make cleaning them easier. We outlined 10 pools here. If you're seeking a buyer's guide and what to look out for then scroll to the end of the article. Follow our guide and recommendations and you can't go wrong with your purchase. 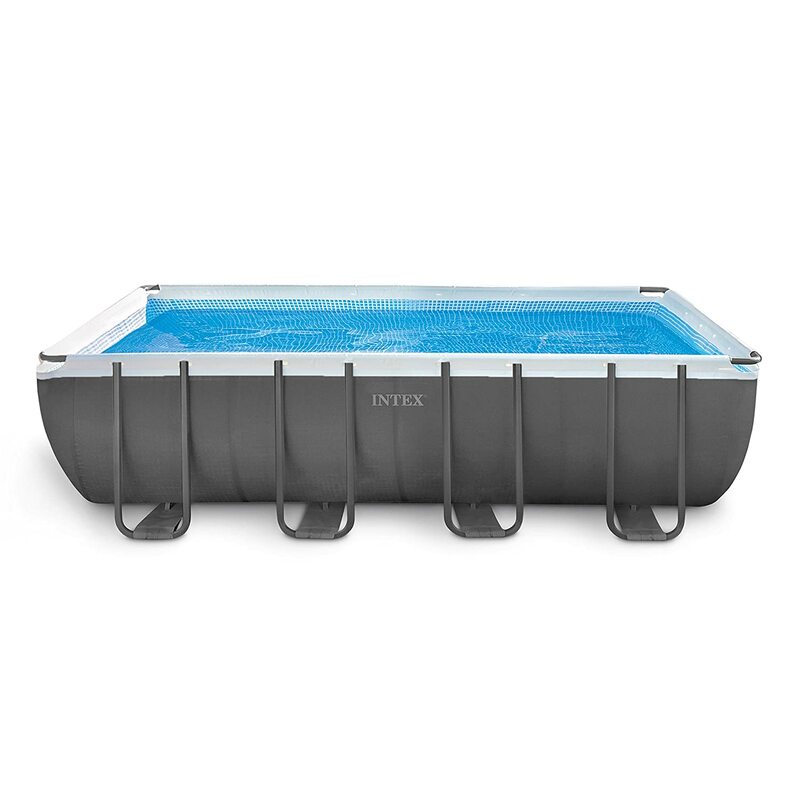 The Intex 12 ft X 30 in Meteal Frame Pool Set is one of the best available above the ground swimming pools available. It is a top choice amongst the best Intex swimming pools. Even though it's almost as easy to set up as the inflatables, it is definitely much better quality. For example, the pool isn't just made of some cheap plastic that can easily be ripped and torn. It's made out of metal and synthetic laminated cloth walls to make sure that it is strong and stable. While many metal frame pools are pretty weak this one is solid and dependable. Intex did a good job of making it sturdy so that you can lean on the walls and they will hold. there are many people that have left their pool out even during extreme winters. This includes being buried in several feet of snow and still surviving into the seasons and be used. It might not be the biggest pool available, but your kids should be able to swim a little bit in it. Adults might have a hard time swimming, but you can easily fit your whole family in there to relax and play a little bit. There are bigger Intex pools available, but they definitely cost more. Unfortunately, the filter that it comes with is generally pretty weak. It was made for smaller pools so it doesn’t do as good a job as it should do. So you’ll have to do a little more work to keep it clean, but it’s not too bad. With such a small pool all it takes is 5 minutes to use a pool skimmer to get the debris from the surface. A pool vacuum will also do well to clean larger debris that the filter will miss. As for removing the water it’s easy to dump out the water. All you need to do is lower a wall and water will start to come out. As more water comes out you can easily collapse a wall and let more water out. You don’t want to do this every time as it can be costly filling up it up (maybe $15-$30 depending on where you are from). It’ll accept either chlorine or salt water but it doesn’t come with a generator so use whatever water you think is best. If you keep it up for consecutive months I definitely recommend getting a really good pool cover. They are generally pretty cheap but can save you a lot of time cleaning and will save money because you won’t need to refill it as much. 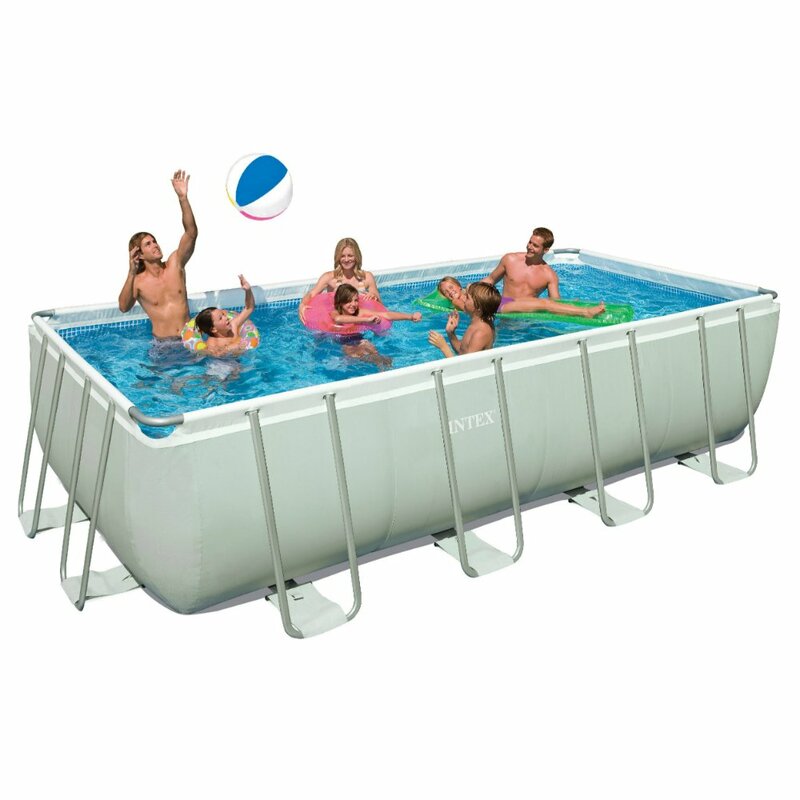 Bottom Line: The Intex Metal Frame Pool Set is definitely a top above ground pool. It is an affordable option that will last for years and keep your family happy. If you're unsure I definitely recommend purchasing this if you're looking for a cheap but good quality above ground pool. When you first get the package it is a little heavy (all pools this size will be) - of about 200 pounds. It's very doable to lift it with 2 people, but if you have trouble then I suggest opening up the box and moving the different parts and bags one at a time. From there it gets a lot easier. Just put it on level ground, set it up with the instructions, and fill it up. It's very easy to get the pool fully installed in 1 day with the most time going to just filling up the pool with your hose. that keeps it up like a charm. 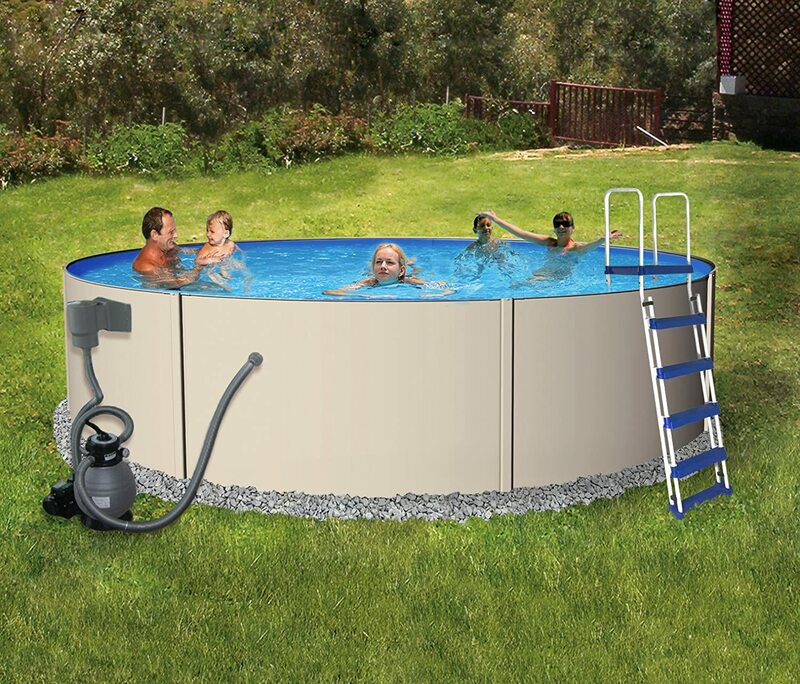 This Intex Above Ground Pool also comes with a really effective sand filter. Sand filters are great for catching small debris and helping you keep your pool clean so that you don't have to spend a lot of time maintaining it. We still recommend you use an above ground pool vacuum, the filter will still be able to do a lot of the work for you. Sand filters are effective and require low maintenance and are the best choice of filters for above ground pools. The ladder leading up to it is a little light and flimsy. It's great for my kids and myself, but it seems unstable if you're above 200 pounds. If this is you then you want to consider purchasing a more heavy duty above ground pool ladder. This pool comes with a lot of extra parts that are necessary for your pool. For example,the best additional item it comes with is a pool cover. It is NOT a winter pool cover and it's a pretty low quality cover, but it does its job. It'll help reduce evaporation so you save money & time filling up your pool and it will keep debris out when you're not using it. Don't expect it to last long since it's a little thin, but it's a great option to keep your pool debris free until you want to buy a better option. It also comes with vacuums, hoses, attachments, and a a pool skimmer - basically everything you need to properly clean your pool. The pool skimmer is great to use since the sand filter won't get stuff on the surface, but it's really only great for leaves since the holes are a bit large. Finally, it comes with a volleyball net. It's good if you'll use it, and bad if not, but hey it's free. It's easy to set up if your kids want to play with it and it can definitely make for some good pool games. Overall, the quality of the pool is great. I've never had any problems with leaks and even the metal hasn't formed any rust for the 2 years I've had it. Bottom Line: It's one of the best above ground swimming pools available. My kids really like playing in this pool and it's great for our entire family of 4 when we all want to use it. It's large enough for us all and large enough to swim in! It's easy to set up and a good quality pool that will last you for years to come. 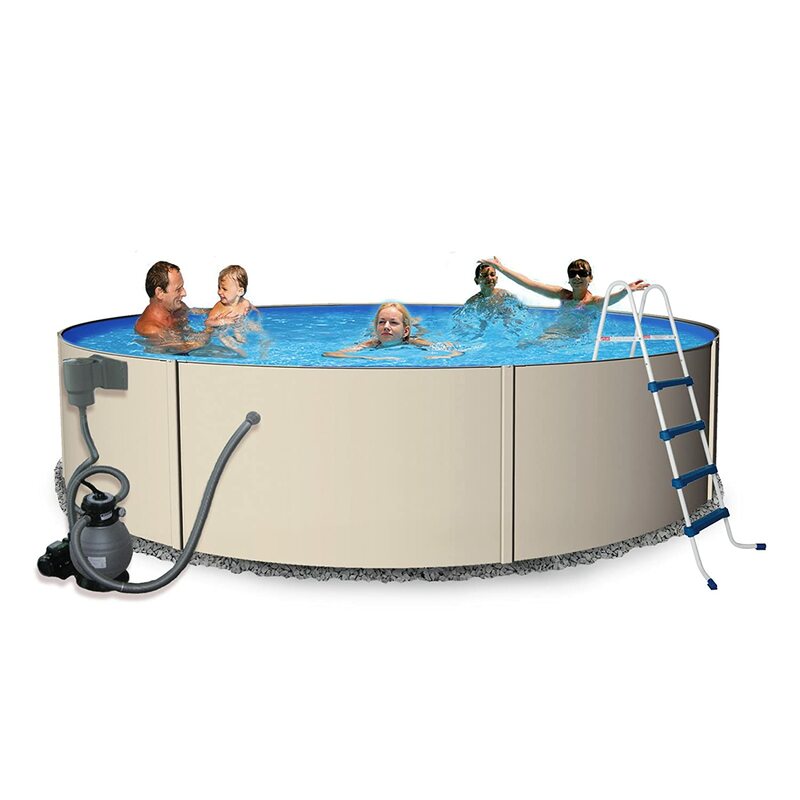 The iPool Deluxe Above Ground Exercise Swimming Pool is a new innovative type of pool. Like any other above ground pool you can relax and stay in there to escape the heat. However, what's make it unique is its special body harness. The body harness is designed to hold you in place as you "swim" in the pool. Although the user isn't moving, the user is still able to practice a variety of strokes and get exercise in so the harness is able to effectively simulate swimming. It is velcro and you can adjust the height and position to change up your exercise and try different swimming techniques. It's adjustable for all types of waist sizes. It’s not as great as real swimming, but it surprisingly works pretty well. 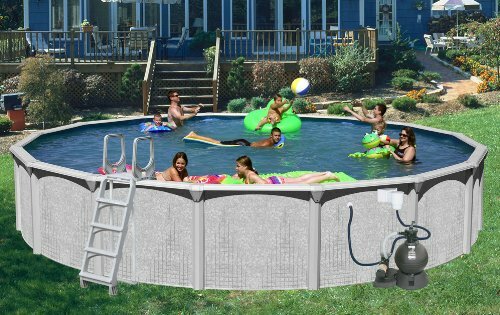 It’s designed for people who don’t want to spend the money on a larger pool or don’t have enough space since it’s just large enough for someone to practice swimming in, and no larger. few hundred pounds. The 2 boxes makes it a lot easier to carry and move around. Actual set up is very easy. Although it claims “30 minutes to set up” it’s probably closer to an 60-90 minutes when following the instructions. They’re easy to follow and offer very good guidance. Where you place the pool is up to you - and because of its small size it can go almost anywhere. It's even fine inside, although it may make the room a little more humid, but at least it'll keep the pool clean. Cleaning the pool is pretty easy since it comes with a filter pump system so it will take care of most of the small debris in your pool. It comes with a pool cover to help protect it from some debris which helps makes cleaning a lot easier. The filter should be replaced about once a year. It will hold both salt water and chlorine system, but doesn't come with either system so it would require you to do extra installation work if you want either system. Either way, it's recommended to switch water out 3 to 6 months so that it won't strain the filter. There is also an option for a heater upgrade. I didn't get it myself, but according to many other users it is DEFINITELY not worth it. This is because the heater was designed for a pool about 1/2 or 1/3 the size of a pool so it is too weak for the size of this pool. In the end it'll just waste your money and wont' do its job of heating your pool so don't bother with the upgrade. 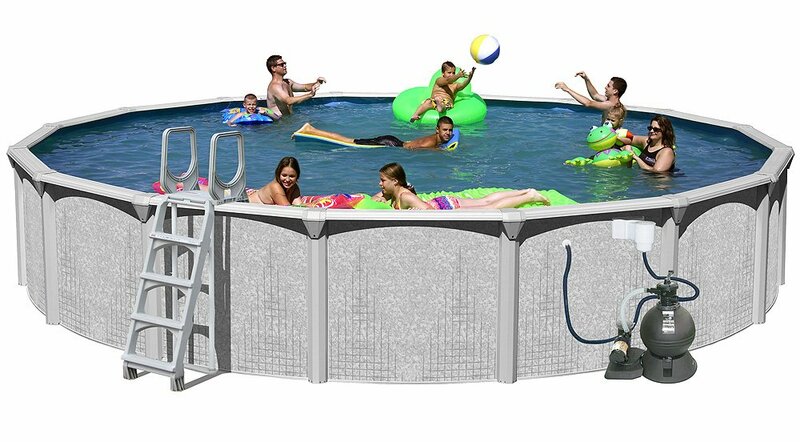 Bottom Line: The iPool Deluxe is a great pool option if you want a lap pool but don't want to pay for a larger one or don't have the space for it. However, if you're just looking for a pool to escape the heat then you want to consider other options. 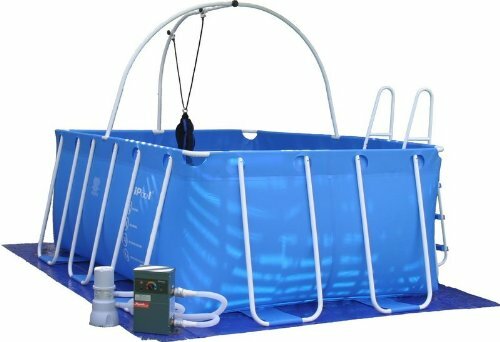 This is overkill as a regular above ground pool and purchasing it without intending to use the harness will waste some money. The Intex Swim Center Ocean Inflatable Pool is the top inflatable pool hands down. Weirdly enough not only have people used it as a pool to beat the heat, but also it is a popular birthing pool option (kind of weird if you think about it). Anyway, it's really solid. 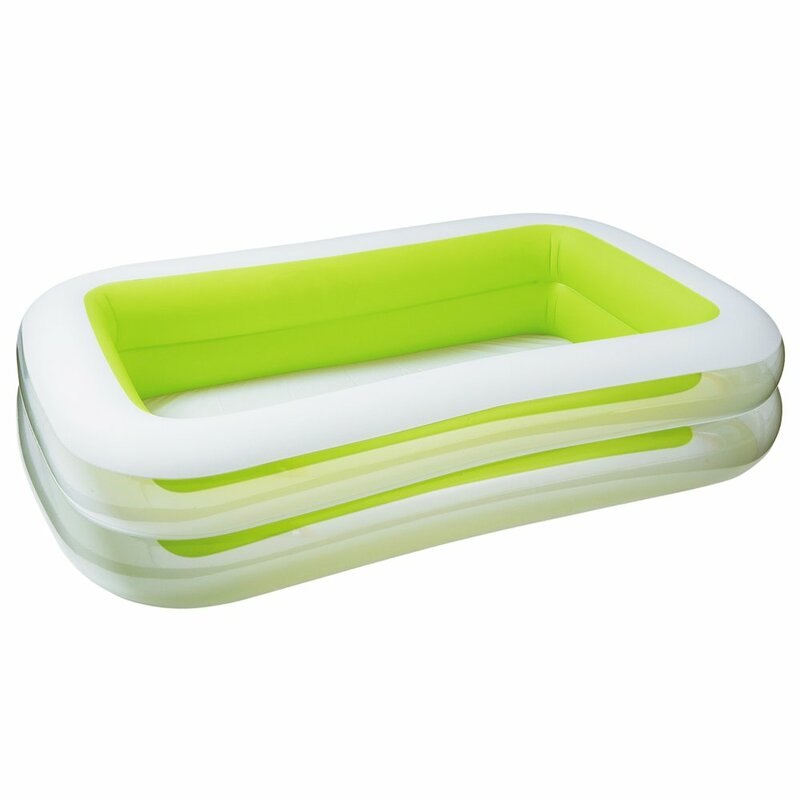 All inflatable pools are relatively easy to set up since you just take them out of the box, lay them out, and put air into them. While this Intex inflatable pool is pretty easy one part that was annoying was the air valve was oddly shaped. Even though I have a ton of different heads for my air pump none of them fit. I'm not sure what they are using, but it must not be one of the most popular options. The way I pumped it up was by using a foot pump. Myself and my husband had to put together the two parts and them very closely while the other person would actually use the foot pump. All in all, it got the job done, but it was a little more difficult than I would like. Especially considering the task itself is so trivial. However, it’s still the best blow up pool available. This above the ground pool is really best for children or small families. Children love it because of the bright colors and it has relatively tall walls for a pool its size. It says it is best for kids older than 6 but it'll work fine for younger kids too - just put less water in it. They will love playing around with it regardless since they tend to love the bright colors. Bonus points if you have water toys or balls you can throw in there. As long as you keep the water level to just a little higher than their knees then they'll be safe as well. It's also large enough for a couple of adults to lounge in their and relax. I LOVE fixing up some margaritas and staying in there for an afternoon with a good book or with my husband. Surprisingly enough it is strong enough to lean back on and rest your arms on. Other inflatable pools tend to give so you can't really put weight on them, but Intex's seems to be much more durable and stable. When you're all done you'll want to just unplug the floor drain plug. This will let the water slowly come out so you can just unplug and forget it. The next day all you have to do is flip it upside down to get any excess water out and deflate it and you're good. It's not worth keeping the water in there for more than a weekend. It's a small pool so it doesn't require a lot of water to put in there. Bottom Line: It's the best inflatable pool for adults and kids alike. It's small size, affordable price, and high quality make it a great option for anyone looking for an inflatable pool. What's not to like about Slash Pool's Above Ground Round Pool. It's the best round above ground pool option on the market for a variety of reasons. The first reason is its sheer size. Splash Pool's Above Ground Round Pool is large enough to do whatever you want - whether it's swimming, being with your family, or hosting a BBQ. It’s as big as most inground pools and is just a fraction of the cost of expensive inground pools. At 4.5 feet deep it’s safe for children of all ages to play in, but still deep enough to have fun and play some games (adult supervision still required). This above ground pool is a little more heavy duty than the other ones we’ve recommended. It’s made with a higher quality and really built to last. With that in mind installation requires a lot more effort and it is recommended to hire a professional to do this. After installation you’ll find it gets easier from here. For starters the quality is overall really great for a long term pool. They typically last for 30-40 years so you’ll never really need to get a replacement – in fact this is backed up by a 35 year warranty. It's really sturdy and dependable and I've had no issues with the structure. Others have reported small leakage problems, but were still able to easily fix the issue by talking to the seller to get address the issue. Either way, it's a pretty easy fix because of the quality product - and do it yourself patch up problems will typically be enough.It also comes with a really powerful pool pump at 1 HP which is easily enough for larger pools. Combine that with the sand filter it comes with and your pool will remain clear because of the filter's cleaning ability. It's made with reinforced stainless steel to last long and be safe and durable for your family. The stainless steel doesn't develop rust despite all the water, though occasional cleanings are recommended. As a more durable above ground pool compared to others it is built to be out in all types of weathers.In fact, it is finished with a Crystex sealant to specifically withstand various weather conditions. You'll want to purchase a winter pool cover to protect it during the winter and when you're not using it to minimize the need to clean it. Bottom Line: It's a top above ground pool that will almost a lifetime. With quality craftsmanship and dependability this is a great pool for those looking to save money in the long run. It's also larger than your typical above ground pool so it'll let you swim, have family time, or even a pool party with ease. 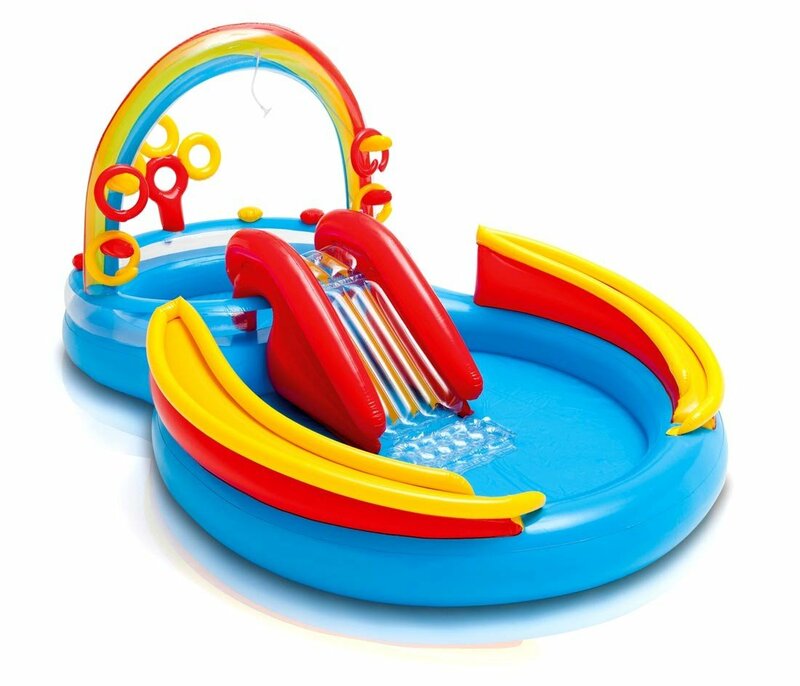 The Intex Rainbow Ring is a the best inflatable pool for kids . It's specifically designed for toddlers to young children ages 2-4 and is a great way to get them to safely play in a pool. It's very easy to set up. All you really do is take it out of the box and use an air compressor or air pump to inflate it. It should just take about 30 minutes to 1 hour depending on how fast the one you're using is. The water is very shallow so there's no chance of your kids being in any danger. It comes with balls and there are a lot of areas that they can be played with. 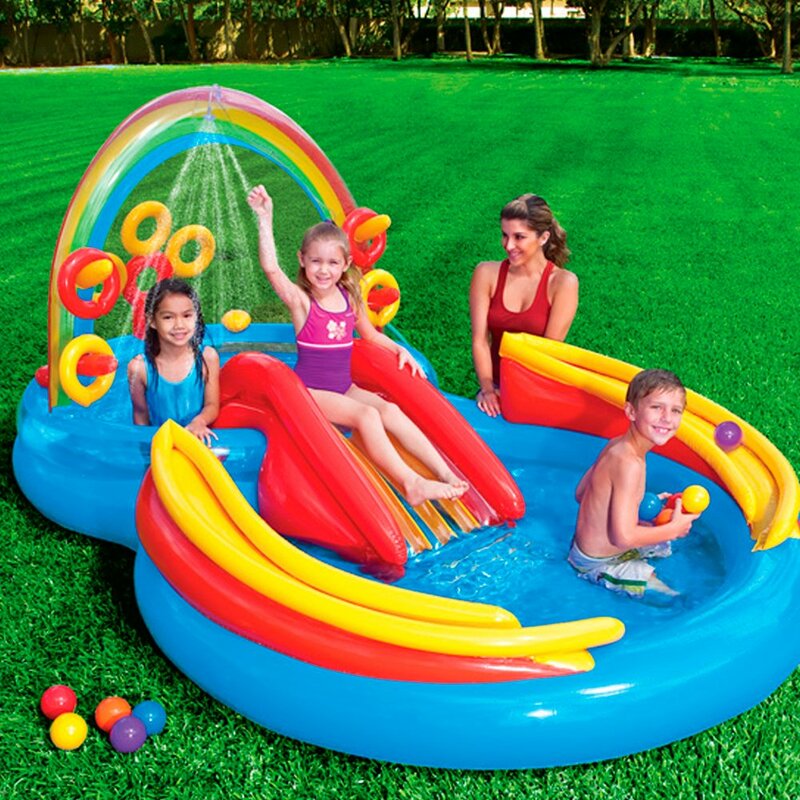 There are steep curves on the sides of the pool and ball hoops so your children can have fun with the balls. My kids would spend hours at a time in the pool just playing with the balls - just be careful as they may sometimes throw the balls out. There is also a slide that my kid loved when he was 2 but it was too small for my 4 year old. The slide itself works surprisingly well for being inflatable plastic, but I wouldn't recommend trying it out for yourself. still enjoy it, but you’ll want to start transitioning them into a real pool. It’s better to get it when they are 2 or 3 so they can enjoy it for a few years before transitioning out. Putting away it is a lot easier than it used to be. In previous years you would have to manually empty out the water yourself by turning it on its side or using buckets to take the water out. Now it comes with 2 drainage holes (1 on each side) so you can easily drain it overnight. It gets about 85-90% of the water out so in the morning just tilt it its side to easily get rid of the water. From there, let it deflate, just wait a couple hours, and come back to easily put it away. The quality pool of the pool is rather mediocre – but for the price you can’t expect a high quality pool. The plastic is a little thin so it’s pretty easy to get holes punctured in it, but it’s not so thin so that the holes will just pop up and surprise you. On that note the pool will typically last about 2 years. I retired mine when my kids got older and had it for 2 years but it was still working great. The rainbow started to deflate towards the end, but the rest of the pool worked fine. Bottom Line: This is hands down the best inflatable pool for kids. The Intex Inflatable Pool is 100% safe, easy to set up, and very fun for your toddler or young children. 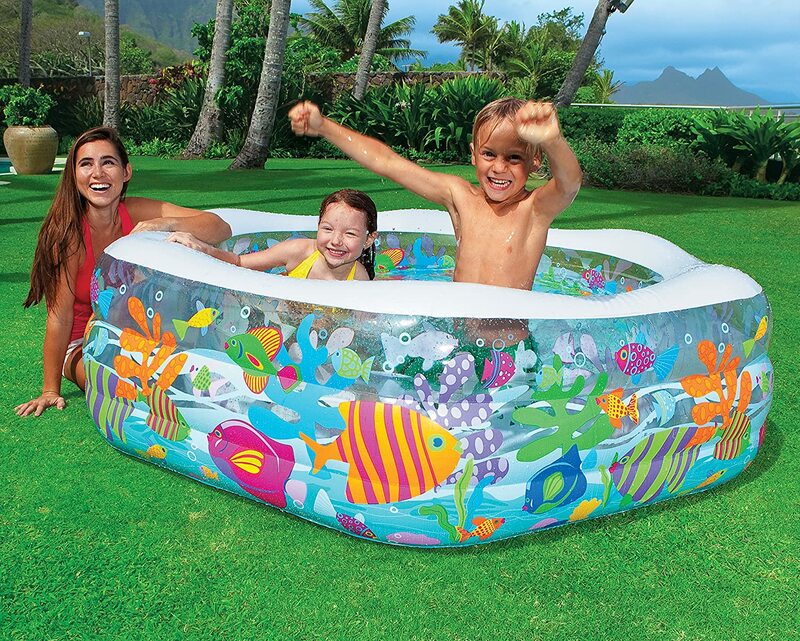 It's very affordable and makes for a great way to introduce your kids to an outdoor pool. The Rainbow Ring also makes for a GREAT gift. 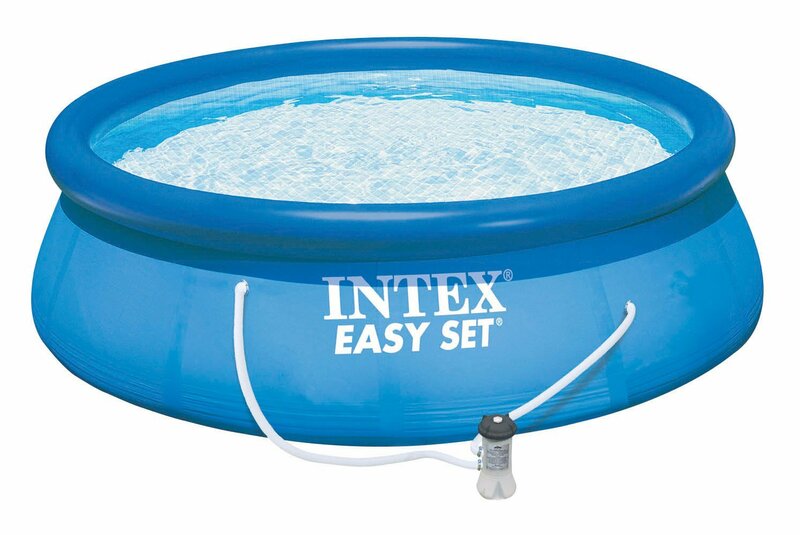 Intex Easy Set Round Pool is a great option for those who are just looking for an escape from the heat. 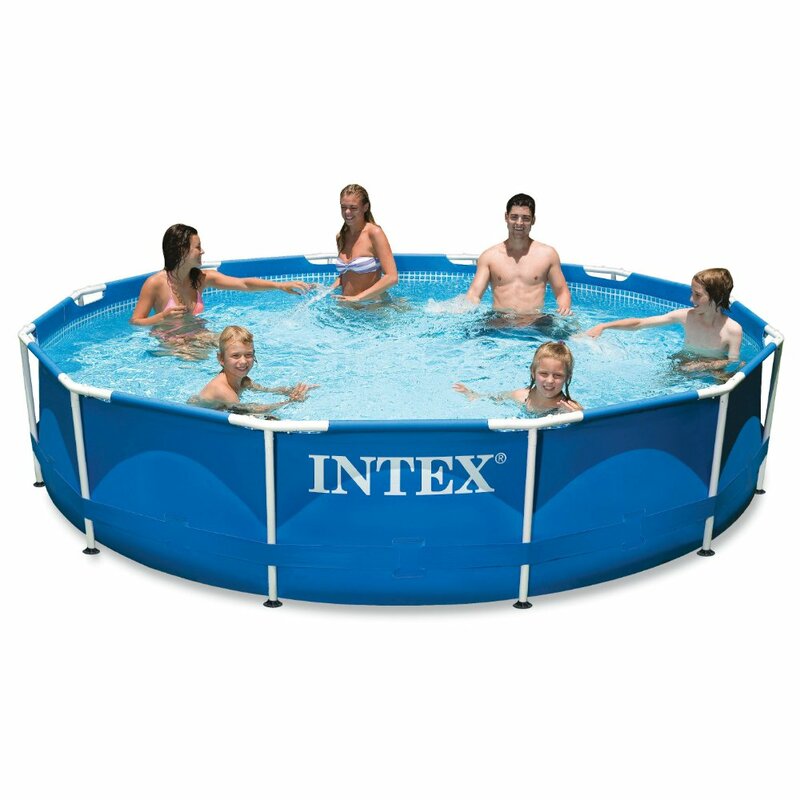 If you're looking for the most accurate review out of all Intex Easy Set Pool reviews then look no further. It's definitely large enough for a family to sit in and relax, but not enough to swim unless you have really young children. So if you're looking for a pool to swim and exercise in then consider other options. 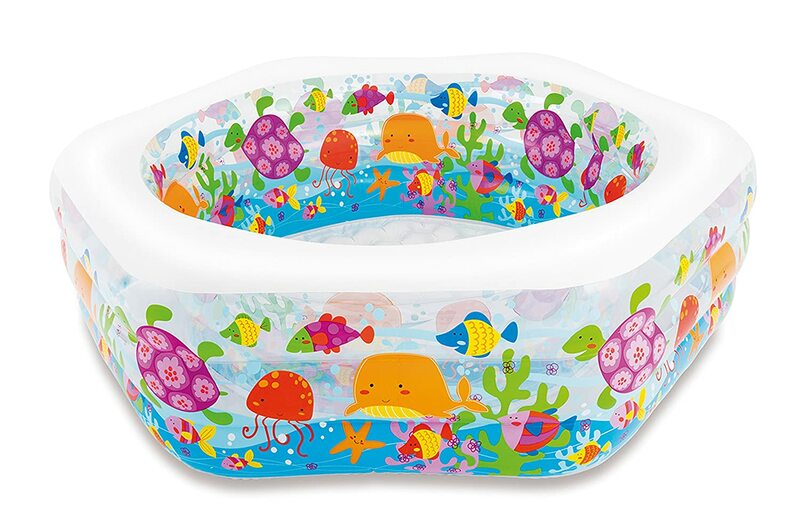 However, this pool is great if you're looking for a short term (about 4-8 years) pool that is portable, easy to set up, and easy to disassemble. First of all it’s a piece of cake to set up. Most people don’t even need to use the instructions to set it up because it’s pretty simple and straightforward. particularly true when it comes to setting up the ladder which is the hardest part about setting up this above ground pool. A big reason is because the ladder itself seems a little low quality and flimsy so setting it properly so it’s stable and secure can be difficult. It’s not too bad since it’s such a small pool so if you’re an adult you can easily help your kids get in (they can climb out easily though) and step over into it yourself. Maintenance with this pool is really easy. It comes with a filter pump that requires a GFCI electrical outlet (standard for outdoor outlets) which does a lot of cleaning for you. It'll easily get most of the sand and dirt that comes into the pool. However, you'll still want to purchase a skimmer and a pool cover to really make it easy on you. You can get both really cheap and a pool cover is truly a must have since it'll reduce the water you need to add to it and protect your pool from debris. One great feature that Intex added is the easy to use drain plug. When you're done with the pool you're able to unplug the plug to easily let it drain out. However, you won't want to do this on a regular basis. Filling up the pool takes a LOT of water - usually around $25-$40 worth of water each time so it's expensive to constantly refill it. Instead, it's better to just buy the pool cover and skimmer to make sure it stays clean. Using chlorine tablets is also a great method to keep your swimming pool clean and germ free. They cost a little more money, but are easily worth it. I personally use chlorine tablets in my above ground pools. 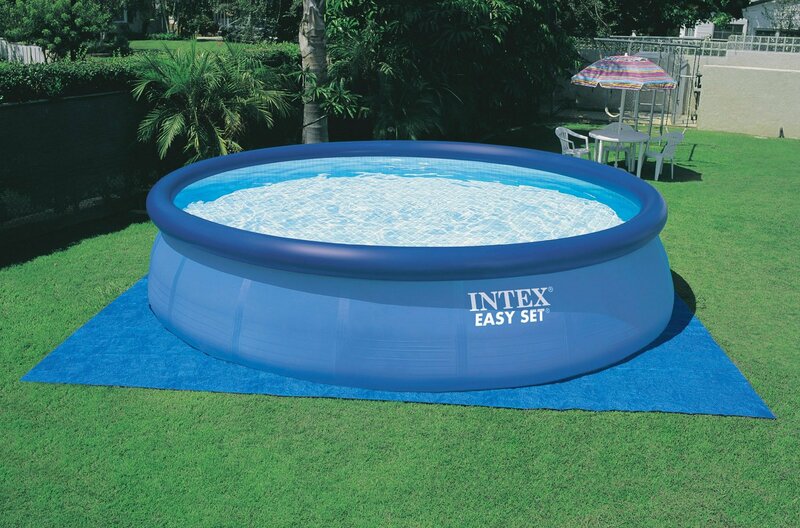 Bottom Line: The Intex Easy Set 15 foot Pool is a great choice and probably the best above ground pool for the money. Relatively inexpensive and easy to set up this will definitely leave your family happy during the hot summer. However, if you're looking for a pool large enough to swim this isn't the one for you. Also if you want more of a long term, higher quality pool check out our review on Splash Pools Above Ground Pool. The Intex Swim Center Family Inflatable Pool, 103" X 69" X 22" for Ages 6+ is a great option for those looking for a cheap pool to beat the heat. Naturally, you get what you pay. Most inflatables tend to be lower quality and just temporarily solutions so it is a great choice if you want to use it for a summer, but it won't last multiple years. It’s a very affordable pool that that is a great option if you have young kids or a baby. You won’t be able to get any swimming done in it, but if you want to sit in it and relax it will definitely do what you expect it to. It can fit in 3 or 4 people making it just large enough for some small families to sit in it. Another great use is by my husband – he used to live to sit with his fit in it and have a few beers with his buddy. Setting it up is so easy because it is inflatable and it's so small. Just lay it out and use an air compressor or pump. If you don't have either one then it'll take a long time so they are must have, but don't come with it. As for cleaning it you should need to dump out the water or use the drain plug that comes with it. When you're done you can just unplug it and the water will slowly drain out. Even though it's a great pool for the price keep in mind it's not very durable. A lot of weight or sharp objects will easily cause tears in the plastic. Avoid these incidents and it can serve you for up to a year, but it is overall quite fragile. Bottom Line: It's a pretty good inflatable pool that will do its job well. It won't amaze you by any means but considering it's price it is a great bargain. Buy it if you just want to use it to just relax and sit in it as that is all it is big enough to do. The Fast Set 12′ x 36″ pool set is utter garbage. The only reason it’s not ranked under the Blue Wave Deep Metal is because it is really cheap so you can expect it to be bad since pricing is one of the factors that I take into consideration. things and this is what really lured me in. Another thing that I tend to look for in above ground swimming pools is a control drain valve. They make a huge difference when it comes to emptying out the pool and I think is a must have for pools that aren’t inflatable. Unfortunately, I definitely regretted this purchase. While the first 2 still hold true I had to immediately return it. There were a lot of problems with the pool fundamentals that basically made it useless. For example, it tends to collapse very easily. Now, I don't even expect the top inflatable pools to hold up to a lot of weight but I would expect it to be able to hold up to the pressure of a 5 year old simply leaning back. When my then 5 year old leaned back the pool gave way and spilled a lot of water out when it was only a couple days old. This means it is really weak and will definitely not stand to the test of time which is why I returned it. Maybe a big reason is because it is really thin. I didn't test it, but I've owned multiple above ground pools before and I can tell the plastic is pretty bad. I'm sure if something snagged or something hard brushed against it then the plastic would rip and the air would leak out. It's patchable with a standard patch kit which is not included. Based on other things I have read it leaks very easily. I'm not sure where the leaks come from since I didn't experience it. Whether it is from holes in the pool or it just wasn't well designed is hard to tell, but either way you don't want any leaking in a POOL. Bottom Line: There are a bunch of other inflatable pools that are much better options. Even though this is an inexpensive option it will definitely disappoint. DO NOT waste your money on it. The Blue Wave Deep Metal Swimming Pool is rather lackluster. There's a lot to say about this pool and most of it isn't good. However, there are some redeemable qualities. First of all it comes with 1/2 HP pump which has enough strength for the filter to clean the pool. It also comes with a fully functional skimmer so Blue Wave seems to want to make pool maintenance easy on you. Spanish (no, she/he didn’t make a request). Even if the instructions were clear it’s easy to see that the pool is pretty bad quality. First of all the hose connectors don’t even fit well and it’s hard to get them together. Additionally, the pool structure is weak and unstable so it’s hard to trust with your safety. Based on other reviews it seems to leak within just a few months – sometimes even out of the box. If your ground isn't perfectly even then forget about it - it'll be impossible to set up. Even individuals with completely flat ground had enough trouble with it so imagine doing it on less than perfect ground. The ladder itself is weak and flimsy. I wouldn't trust it to hold any more than 100 pounds - probably even less. If for whatever reason you decide to get this above ground swimming pool then be sure to get another ladder. Or risk your safety. Bottom Line: Don't buy under any circumstances. Almost all of the other pools are better choices - even ones that are just a fraction of the cost of this one. The ratings that I have assigned these above ground pool reviews and inflatable pool reviews are based on my opinion and needs. You may have different needs so don’t just blindly take the ratings for granted. This is always one of the biggest things to consider no matter who you are and what you are looking to buy. Although pricing itself isn't a big factor in the ratings it is something that is taken into consideration. As with any product there is a trade off between price and quality. With all of these reviews we discuss both above ground pools and inflatable pools. Generally, inflatable ones are cheaper, but are also lower quality. On the other hand, above ground pools tend to cost more money but are higher quality, larger, and last more. Understanding the price range you want to work with is important so you don't go over. For some of the more expensive pools there are financing options to make it easier for you. They will let you pay a monthly amount instead of an upfront cost so it is less of a financial burden. Installation is one of the most important parts about an above ground pool. Depending on what type you get it may be really easy. In fact, most of the ones we reviewed are pretty easy. However, there are a few that may require professional installation. These are the much nicer above ground pools that are built to last, and are ultimately worth it. The inflatable ones are typically very easy. For all of them you just need to take them out of the box, lay them out in the desired area, and pump them with air. Some nozzles may be difficult to work with and may require a little extra work, but ultimately they are very easy. Cleaning them up is now easier since many now come with a plug drain. This makes it easy to get rid of the water without using buckets to do all the work yourself. For above ground pools with metal frames they are not as easy to set up, but can still typically be done in just a few hours. The lower quality ones may take longer since the pipes and hoses tend to not fit as well. Fortunately for these types of pools you don't put them away. Instead, you'll just keep the water in them after installation. Get a pool cover for these! A lot of these pools are different sizes. You'll want to see what is right for your backyard or house. An important note is that sizing directly affects price - larger pools tend to be pricier. 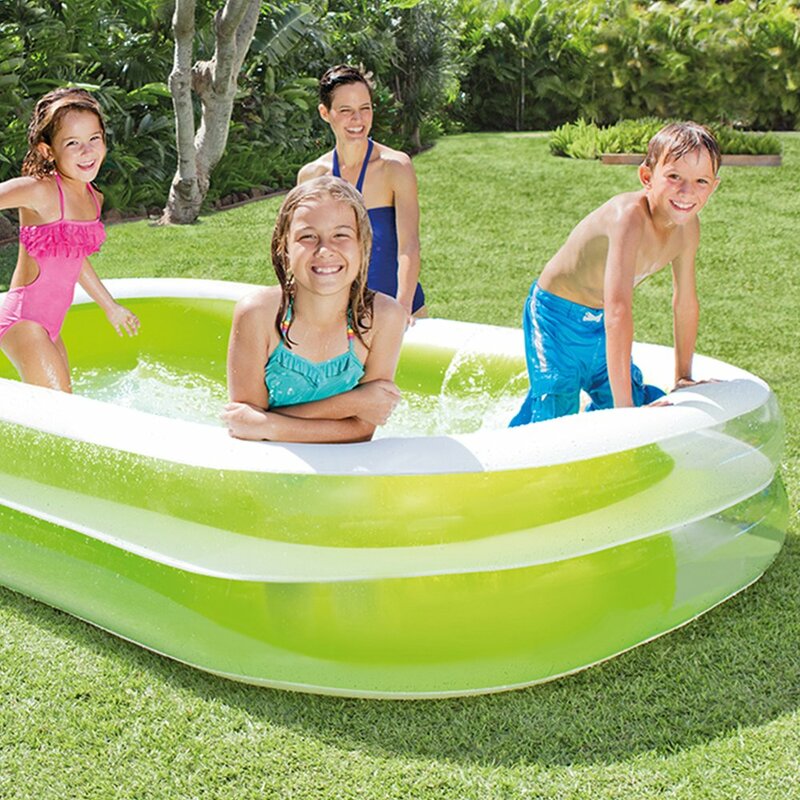 Overall, inflatable pools tend to be very small and compact. You can expect to sit and relax in them, but you'll have a hard time swimming in them. These types of pools also make for great play areas for kids and are safe choices as well. The metal frame above ground swimming pools are typically much larger and can be swam in. This is important if you want to use your pool for exercise, water therapy, or teach your kids and get them a lot of exposure to water play. Shape is another important option to consider. This tends to be less important than size, but is related since different shapes have different dimensions. Most above ground pools are either rectangular or round - with a few oval ones. Rectangular tend to be the ideal choice if you have the space. You can do the same thing in rectangular pools as you can in round/oval ones. Round pools are typically easier to fit in a yard or indoors, but don't expect to be able to swim much in them. It's definitely possible with some of the larger round above ground pools, but they're typically associated with smaller pools. If you're going to own a pool then maintenance is very important so that the pool can be kept clean and have a long lifespan. Fortunately, you can leverage robotic pool cleaners or above ground pool vacuums to help you out here. Fortunately, all of the inflatable pools require no maintenance. All you do is pack them up and put them away after a weekend of use and they'll be fine. However, if you have some of the larger pools like the metal frame ones then refilling the water isn't ideal since it can take a long and be expensive. Instead, it's much better to just maintain the pool. Even though most of the ones come with filters and pumps some of these included units are lackluster or are not the ideal size. To maximize the work from these units you may want to look into purchasing individual units and attach them to the pool. In addition to filters and pumps you'll want to use a pool skimmer once a month in order to get debris off the surface. Additionally, using a pool vacuum or automatic pool cleaner is a great idea to get rid of larger debris. Finally, most above ground pool owners tend to use chlorine tablets to keep the water sanitary and free of germs. They are necessary if you keep the water in the pool for a week or more, but are worth it for health reasons. Chlorine tablets will help kill bugs and any potential algae that might grow. How long your pool will last is an important factor. You don't want to buy a pool expecting it to last years only for it to break down, leak, or tear a few months later. Nothing is more frustrating. If you want a pool that is durable and lasts for years then you'll definitely want metal frame, concrete, or reinforced plastic above ground pools. They will last multiple seasons and usually come with a warranty. These types of pools are also less likely to break down. Additionally, any problems such as leaks are very easily fixed and patched. If you like to lean back and want a dependable pool that will be safe for your family the look into these nicer, more permanent pools. On the other hand inflatable pools aren't very durable. They are typically made from a thin plastic that is easily ripped or torn. Most will only last a few months at a time, but with proper care the better ones can last a few years ( at best). You don't want to be spending hundreds or thousands of dollars without protection. Unfortunately, the cheaper pools (like the inflatable ones) tend to not come with a warranty. However, most of them are cheap enough to not require one anyway. The bigger, more expensive above ground pool options typically come with varying warranties. For example, Splash Pool's Above Ground Pool comes with a 35 year warranty so you know it will last for years. Choosing the right above ground pool is not an easy task and requires time and research. Hopefully, our best above ground pools reviews will make it a lot easier for your buying needs and you'll understand what to look out for. Good luck in purchasing, and if you have any questions please let us know in the comments!